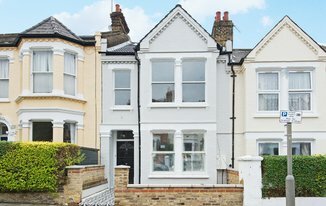 An Immaculate, RECENTLY REFURBISHED five bedroom terraced house situated just moments from EARLSFIELD TRAIN STATION. The ground floor comprises of a large open plan kitchen and dining area with bi-folding doors leading out on to the well-kept garden, a spacious double reception room, a separate TV room, a utility area with extra storage and a downstairs WC. The upper floors comprise five good sized bedrooms arranged over two floors, the master room with en-suite and a further family bathroom. Bassingham Road is located just off Earlsfield Road on a quiet residential road just moments from the excellent shops and restaurants both in Earlsfield and in the Southside Centre. Earlsfield Station (National Rail) is within walking distance, offering quick and easy access to central London.